A 187-year-old mansion is facing costly repairs after a copper thief targeted the historic property. 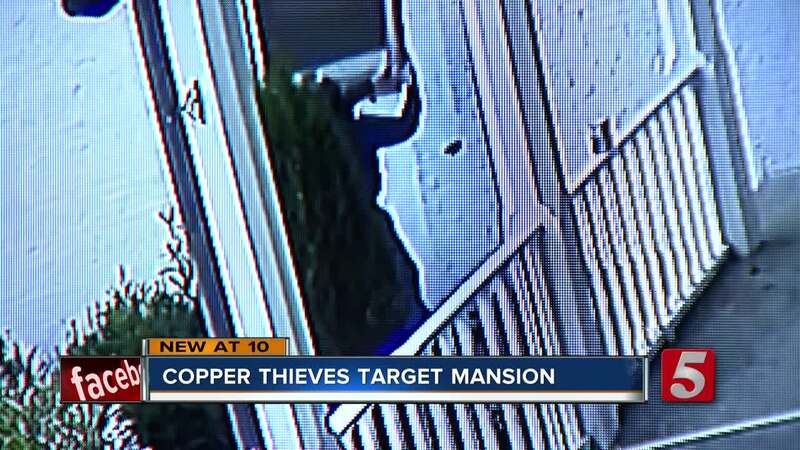 DONELSON, Tenn. (WTVF) — A 187-year-old mansion is facing costly repairs after a copper thief targeted the historic property. Lewis James, who owns the Belair Mansion in Donelson, said somebody broke onto the home's grounds Sunday around noon. Security footage shows a man ripping a copper downspout off of the side of the home, and then clipping copper wires from light posts that are being installed. On Friday, you could still see where the thief cut the wires. "I was pretty upset," Lewis James, the mansion's owner, said. "You feel kind of violated. Why would someone, why would anybody come and vandalize a 190 year old house?" The house was built in 1832. Over the years it's seen a list of owners, including a Nashville mayor. The antebellum mansion was added to the National Register of Historic Places in 1971. James has been restoring and renovating the mansion since he bought the property in 2016. He plans to turn the historic site into a bed and breakfast. James added that the thief's haul wasn't worth very much. He estimated the crook would get about $25 dollars for all of the wiring, but it will cost much more for crews to repair and replace the damage the thief left behind. "That's going to cost us hundreds of hundreds of hundreds of dollars to repair," James said. James also worries that the vandalization could leave a lasting mark. While the downspouts were only a few years old, they were connected to gutters that are at least decades old and possibly original to the house. "Hopefully that's not damaged too much," James said. James said the Metro Nashville Police Department has a suspect, but as of Friday afternoon had not made an arrest in the case. "I'll be happy to see him arrested," James said. "I just hope he'll come to his senses and realize what he's doing." As for how the crimes will impact the renovation? "It'll slow us down some, but its not that big of a thing we cant overcome," James said. James set up a fundraiser to help with the Belair Mansion renovations.